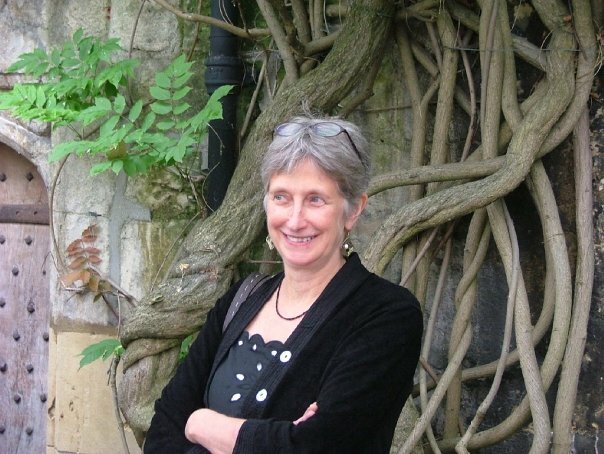 The fourth in our series of readers’ stories is from Sue Smith who has recently completed a Postgraduate Certificate in Historical Studies at the University of Oxford. Sue is a member of Oxford Quaker Meeting and co-clerk and resource person for Quaker Peace & Social Witness Turning the Tide programme. Sue is especially interested in the history and practice of nonviolence, and other conscience driven forms of resistance to authority and power. It was the little bits of paper that got me. Often a couple of inches square, hardly more. Handwritten by Gandhi, to members of the India Conciliation Group (ICG) on their visits to his ashram. They were so brief, but they made the wonderful mix of humour, tact and utter honesty that was Gandhi’s hallmark come alive. It was as if he was in the room when I read them. They are in amongst the ICG papers in Friends House Library. I came across them while researching for a dissertation on what Quakers were doing in India in the 1930s and 1940s. My parents were in the Friends Ambulance Unit in Bengal during the Second World War, and I wanted to know: what contribution, if any, did Quaker work make to Indian independence? I had never heard of the India Conciliation Group before, but from my research I learned a lot about other people’s perceptions of what Quakers do out there in the world, then and now. The ICG attempted to mediate between British political decision-makers and Indian independence leaders. They made personal contact with everyone they knew with political influence, in Parliament, the Cabinet, in other churches, lobby groups, and women’s organisations. ICG members knew and admired Gandhi and were supportive of his work, although sometimes their worries about his methods speak out from the letters they wrote to him. Horace Alexander, the best known figure in the group, and also the head of the FAU for a period, remarked wryly that he had been “out-Quakered by a Hindu”. I had imagined that Gandhi had always been a popular figure among Quakers – how could he not be? He was a practitioner of nonviolent methods, the inspiration for pacifists, a key figure in the India independence struggle. Many British Quakers welcomed him, but others were uneasy about his use of civil disobedience campaigning as a strategy to hasten Indian independence. Was he not provoking violence in the Salt Marches, and other campaigns, and damaging his own cause? Surely conciliation between the British Raj and Indian nationalists would be a better approach? Quakers are usually supportive of the value of individual pacifism, but, historically, when nonviolent methods have been used to further political ends, many have become uneasy. Quakers were seen by all sides in this struggle as a good thing, but not all parties quite understood what they were trying to do. Some politicians at the time found them irritating. Some Indian independence leaders were infuriated by their attempt to be even-handed. But when Indian independence was finally achieved in 1947 the new leaders of India courted them assiduously, and towering figures like Nehru (himself a proponent of nonviolence) privately acknowledged their influence in the wave of optimism that accompanied the post-war establishment of the United Nations. My dissertation, Goody-goody fellows? Quakers and the end of empire in India, is held in the Library at Friends House and is also published online as a British Empire at War Research Group Paper (BEAW research paper number 3). You can find out more about the papers of the India Conciliation Group (TEMP MSS 41-52) from the Library. This entry was posted in Readers' stories and tagged Gandhi, India Conciliation Group, Nehru, nonviolence. Bookmark the permalink. As usual, the Quaker Strongrooms blog has an interesting story new to me. For your information, I clicked on, and later typed in, the address given for the website relating turningthetide . In each case I was directed to a site in the USA which has the address revisedturningthetide dot weebly dot com . It is based in Pennsylvania, but does not seem to have information about Friends and non-violence as suggested. I felt you should know. Best wishes. Thanks for pointing this out Wynn. The url should be http://www.turning-the-tide.org/ – it seems to have got mangled! Apologies for this mistake, and thank you for your interest. I do believe the “elderly Quaker woman” you referred to would have been Marjorie Sykes. I would be very interested to meet you and hear about the stories she told you as I am presently undertaking research about Marjorie.